Today, finally some justice as Chief Justice Wayne Martin ruled that the EPA and W.A. Government’s approvals processes for the gas hub at James Prices Point were unlawful. I hope the folk walking the Lurujarri Dreaming Trail at the moment are celebrating with Goolarabooloo and country at Wirrar/Barred Creek today. Blessings to this country and the people who held a high feeling of connection throughout the dark times. TO understand the Aboriginal heritage concerns of Kimberley law man Joseph Roe, it is necessary to appreciate the cultural meaning of life and death. How ancestral essence flows below the surface of the ground and the worlds are bridged by songs that contain the codes of behaviour fundamental to sustaining the balance and wellbeing of the land and its people. These concepts do not sit easily with the practicalities of modern-day life in an export-driven world.Roe and other Kimberly law bosses are responsible for keeping their culture alive in an area now targeted by West Australian Premier Colin Barnett and Woodside for a gas hub. So, when they say protection of the area is a matter of life and death, it is easy to dismiss their concerns as histrionic. But for more than the past three years some of Australia’s most respected Aboriginal heritage lawyers have worked pro bono on Roe’s behalf. From their Sydney offices, the lawyers have been shocked at what they say has been the contempt with which the West Australian government and Woodside have run roughshod over the state’s heritage laws. …And indigenous heritage has been sold short by the Kimberley Land Council, which may have had the best of intentions but has lacked an ethical spine. The lawyers say their investigations reveal a trail of deceit in which records that prove the legitimacy of Roe’s heritage claims have been overlooked or ignored. The Kimberley Land Council, they argue, has worked with Woodside and the state against the interests of some of its own clients (Roe and the Goolarabooloo people). Woodside has been prepared to tell the state government to withdraw warnings that it may be acting in breach of the law that could put its directors in jail. And the government has been happy to comply with its wishes. The lawyers have demanded Woodside be prosecuted for criminal acts of damage but their requests have fallen on deaf ears. An application for emergency protection has sat on the desk of federal Environment Minister Tony Burke for more than 12 months. Since the company bulldozers first went in, under the protection of state police, a 12-month statute of limitations on prosecution for the initial alleged breaches of the Aboriginal Heritage Act has expired, without the State’s investigation of the alleged breaches reaching a conclusion. James Price Point is not another Hindmarsh Island, where accounts of secret Aboriginal business surfaced late in the day to derail a proposed development. Documents prove that heritage values at James Price Point were identified long before the gas hub was first mooted. It is not about whether or not there should be an export gas hub in the Kimberley. Or whether an indigenous man with a flawed past has been seduced by the limelight of a national environmental cause. The fact is, Dampier law bosses have never given their consent for a gas hub at the James Price Point site being pushed by Barnett and Woodside. The traditional custodians have suggested a less culturally sensitive site further to the north that would allow the gas project to go ahead, the $1.3 billion compensation package for local indigenous groups to continue and what is arguably the nation’s most defined songline – a path made by Dreamtime ancestors – to remain intact. The area’s significance, and Roe’s authority to speak for it, have been confirmed by Scott Cane, one of Australia’s most respected anthropologists, who was commissioned to investigate by the West Australian Department of Indigenous Affairs this year. According to Cane’s report, there is no doubt Roe has a detailed knowledge of the core narrative that defines the Northern Tradition. “It was readily apparent in conservation with Joe that he knows the religious narrative intimately, has a comprehensive grasp of the song cycles associated with the narrative, and is in command of the relationship between that narrative and the landscape in which it is embedded,” he said. For Chalk and Fitzgerald lawyer Andrew Chalk, Cane’s findings amplify the injustice that has been done to what he describes as perhaps the nation’s most comprehensively mapped songline. 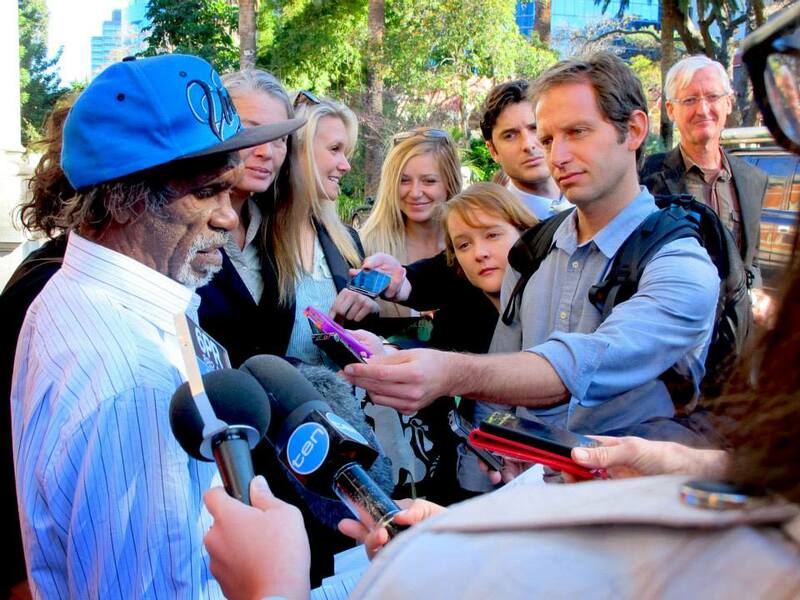 “I have been doing this (cultural heritage work) since before native title existed,” Chalk says. “I was involved in the drafting of the Native Title Act. But I have not seen instances where senior people within the state or within a representative body have been so willing to flout their own legal duties to get an outcome. “It is about the willingness to put aside lawful process within the Kimberley Land Council and the willingness of the KLC to put aside lawful process within the KLC and for the state to turn a blind eye to its own laws – which carry serious criminal penalties,” Chalk says. It is a window into how heritage administration is managed in a mining boom in Western Australia, where no matter how significant an area is the government seems happy to look the other way. You will not find another dreaming track in Australia that has been so carefully mapped for such a long period and where in the face of an economic opportunity there is such a preparedness on the part of all the key agencies to ignore the evidence. According to Chalk, the foundation on which the injustice is built has been the willingness of the Kimberley Land Council to forget or ignore cultural heritage work it was involved in before the gas hub proposal ever existed. Lengthy correspondence between the state Department of Indigenous Affairs and Woodside clearly shows how tough the company has decided to play. After undertaking its own ground surveys last year and rediscovering heritage information that was accepted in court and by the Aboriginal Cultural Materials Committee more than 20 years ago, the department wrote to Woodside advising its development work at James Price Point may jeopardise a heritage site. Woodside rejected the advice and successfully lobbied for it to be withdrawn. It declined to comment on correspondence with the government, in which it said the timing of the new heritage information was “vexatious”. But, in a statement, a company spokesperson said: “Woodside is working closely with senior traditional owners to identify and carefully manage Aboriginal culture and heritage at the site of the proposed Browse LNG Precinct. A spokesperson for the West Australian Minister for Education, Energy and Indigenous Affairs, Peter Collier, confirmed the advice to Woodside had been withdrawn. “The department withdrew the letter and maps as the content was – upon review – unhelpful and did not properly advise Woodside of known registered sites,” the spokesman says. The Heritage Act is meant to protect all sites, registered or not. Chalk is highly critical of the way the KLC has handled the heritage issues at James Price Point. Greens MLA Robin Chapple is prepared to be charitable and say the KLC lacks the “corporate knowledge” of work that has been done in the area over two decades. But, according to Chalk, the land council has pushed the gas hub proposal “without reference to the critical Aboriginal heritage significance of the area”. A meeting of law bosses in 2005 supported the Roe position that the area was too sensitive to be developed. But the KLC pushed ahead. Chalk’s complaints are about process. He says Woodside could have sought upfront approval for its works under the Aboriginal Heritage Act, but chose not to. And he says the state has been prepared to participate in an abuse of process to strengthen Woodside’s hand. He accuses the company of acting outside the bounds of its heritage mission statement. “Even if it is legal, should a company like Woodside be bulldozing a place like this?” Chalk asks. Nonetheless, he has some sympathy for the KLC’s position. Chalk says the difficulty for the KLC is that, no matter how logical its reasoning may be, Roe’s responsibilities under indigenous law do not allow for compromise. “It is no different to saying to some Orthodox Jews, look, the Wailing Wall and East Jerusalem is not worth the grief. The Australian September 08, 2012 12:00AMWOODSIDE wrote to the West Australian government at least twice last year asking it to withdraw written advice about the possible existence of significant Aboriginal sites in areas disturbed by its proposed $40 billion James Price Point gas hub. Any damage to the sites integral to an important Aboriginal men’s song cycle could leave the resources giant and its directors liable for criminal prosecution under the state’s Aboriginal Heritage Act. A government spokesman confirmed that the Barnett government succumbed to Woodside’s wishes and withdrew the letters. Andrew Chalk, lawyer for indigenous law boss Joseph Roe, who claims cultural responsibility for the area, said Woodside’s actions had been “like asking a burglar not to tell a buyer that goods for sale are stolen”. Mr Chalk said letters from Woodside to the state government underscored how the government and the company had run roughshod over heritage concerns at the site near Broome in pursuit of development. He said that the song cycle had been well documented for more than two decades but many details of it are considered men’s business and must remain secret. The WA Department of Indigenous Affairs wrote to Woodside after evaluating heritage claims following contentious site works in the middle of last year. The visit followed the discovery of heritage records that pre-dated the Woodside proposal and included interviews with Mr Roe. Lawyers claim information about the area’s heritage value in the Kimberley Land Council’s possession since 1991 was not included in the heritage advice given to Woodside more recently. The material pre-dates Woodside’s decision to investigate the gas hub site. Scott Cane, an anthropologist commissioned by Indigenous Affairs, has confirmed Mr Roe’s standing as a significant figure in indigenous law for the area. “It is clear to me that his knowledge of the religious tradition is comprehensive and his commitment to that ‘law’ is consistent with both his knowledge of the tradition and his ancestral responsibility to it,” Dr Cane wrote in his report on July 16. Dr Cane’s report follows the rejection of DIA’s advice about the significance of the area the previous year. In a letter to the state government dated September 5, 2011, Woodside thanked the department for withdrawing an earlier letter expressing the potential significance of the area. It asked that further advice from the department in relation to a “possible site” in the vicinity of the proposed gas hub also be withdrawn. Woodside had said the area involved was too big and the timing was vexatious. The company objected to details of the significance of the area being withheld on the basis they were for initiated males. Woodside said it was being denied “procedural fairness”. A spokesman for WA Education, Energy and Indigenous Affairs Minister Peter Collier confirmed the advice to Woodside had been withdrawn. “The department withdrew the letter and maps as the content was, upon review, unhelpful and did not properly advise Woodside of known registered sites,” he said. A Woodside spokeswoman declined to comment specifically on communications with the state government. But in a statement, Woodside said the company was working closely with senior traditional owners to identify and carefully manage Aboriginal cultural heritage at the site of the proposed gas hub. “We conduct our activities under the supervision of traditional owner monitors,” it said. Woodside would seek all additional consents and approvals needed to conduct any activities in areas known to contain Aboriginal heritage. The project, with a $1.3bn social benefit package for Kimberley Aborigines, has split Broome’s indigenous community and drawn environmental protesters from all over Australia.